We are glad to introduce Trading Tuitions Academy, an integrated online learning platform for traders and investors all across the globe. This platform will enable you to learn and practice algorithmic trading concepts using Amibroker software. 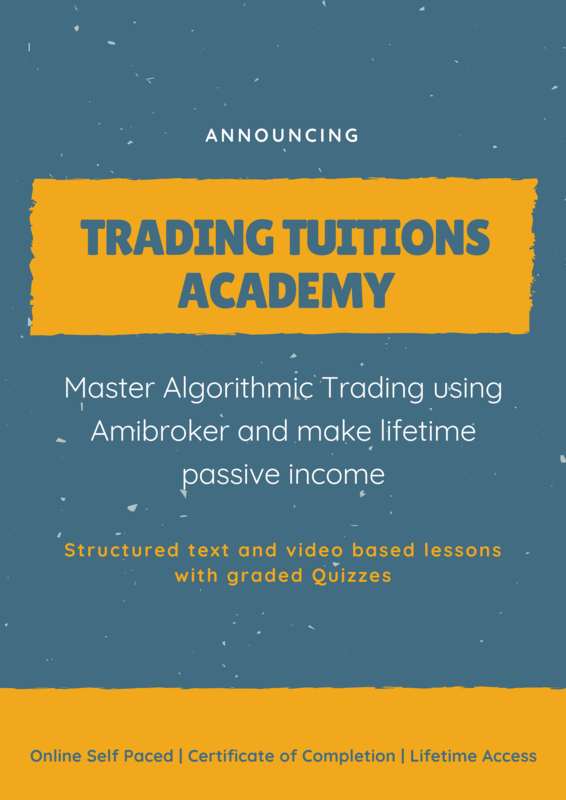 Trading Tuitions Academy offers professionally curated courses for Amibroker formula language (AFL) and Algorithmic system development. And this is just the start, we are constantly working to add many other interesting courses in the near future. Our team of experts has spent more than a year to structure the contents of these courses by surveying hundreds of traders. You may find many videos and blog articles over the Internet around Amibroker and trading system development, but none of these are complete and organized. Beginners find it difficult to digest multiple and conflicting sources of information and eventually they give up. We have tried to solve this problem by organizing the course content in a beginner friendly ‘Do it Yourself’ manner so that you learn what you need all at one place. In a nutshell, there are years of experience bundled into courses which you wouldn’t find anywhere else. In this course, you would learn Amibroker formula language (AFL) from the very scratch. Using AFL, you can create your own technical indicators, scanners, explorations and even trading systems. Don’t worry even if you don’t have any prior programming experience, we have got it all covered. This course is well suited for absolute beginners as well as professionals who want to up-skill themselves in Amibroker. Check out the course curriculum for more details. Learn how to develop a profit-generating trading system and make passive income for a lifetime. There are 5 readymade trading systems included in this course with a video walkthrough. 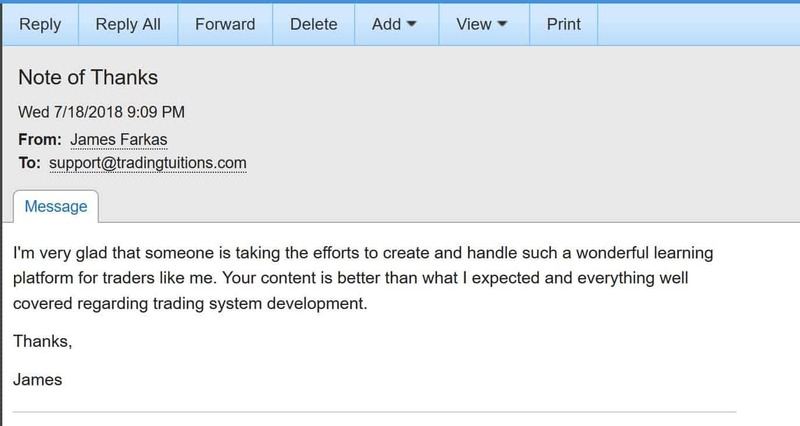 And the course content would help you develop many more systems on your own. Although this course is designed specifically for Amibroker users, yet you can apply the same concepts in any other software too. Read more about the course curriculum here. A course bundle which will give you lifetime access to Course 1 and Course 2 above. This course would enable you on all aspects of algorithmic trading that includes ideation, coding, system design, backtesting, optimization, and go-live. Read more here. 100% refund guarantee if you are not satisfied with the course. As a subscriber to any of our course, you are entitled to some amazing bonuses. These would complement the course material and empower you in your trading journey. Bonus 1: 700+ tested AFL codes from our experts. You will find readymade codes for your systems and need not to re-work from scratch. Bonus 2: 10 E-Books related to technical analysis and options trading. These are some of the bestselling E-Books highly recommended for reading. Bonus 3: 7 Excel sheets for trading systems, risk management, and technical indicators. Bonus 4: An ultimate audio course for mastering Options trading. The combined value of these bonuses is 275$, but we offer it for free with this course. 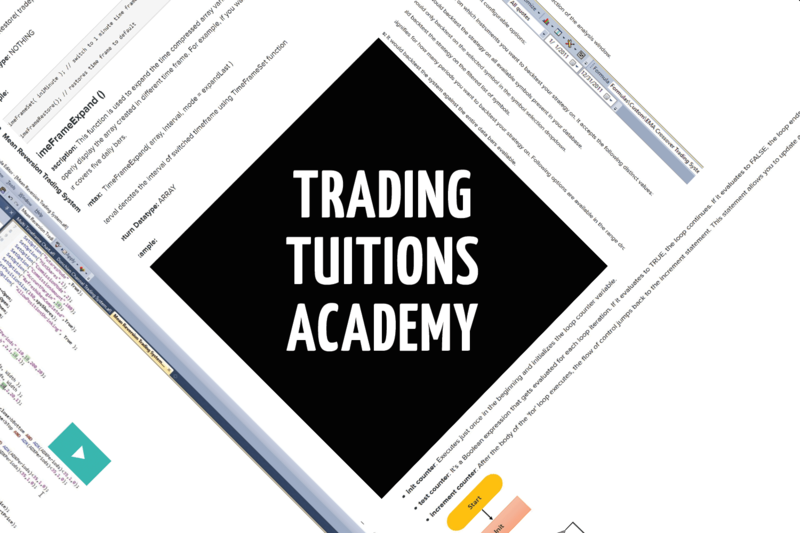 Not to brag about our success, but Trading Tuitions Academy has received amazing response since it was launched a month ago. We already have 300+ students and count is growing. Visit Trading Tuitions Academy from this link. Browse through the list of courses in listed in the homepage. In the course page click on ‘Enroll in Course‘ button. Complete the payment using Credit card or PayPal. Even though the course fee is shown in Dollars, you can still pay through your local currency. Once the payment is processed, you would be enrolled in the course instantly and can start learning. If you are stuck somewhere or have any additional queries, please drop a note to support@tradingtuitions.com. Seems to be good course, but somewhat costly. I would like to go for The Complete Algorithmic Trading Bootcamp: Course Bundle but for want of financial resources. Please let me know if I just do the first course, will I be in a position to create my scanner and automate the process of trading (buy – sell) ?